Friday, Nov 7th was the final day of the Sloan-C Conference. There were two morning sessions I attended that were both pertinent and outstanding. The first was presented by Lisa Bunkowski, Michael Eskey, and Marcia Peterson from Park University's College for Distance Learning titled Innovations in Mentoring and & Evaluation. The team presented a thorough case study of a new, inventive approach to evaluation and mentoring that has been integrated into their own online program. The process for mentoring especially interested me, as it provides the online instructor with consistent feedback, in the form of a dialogue rather than a typed form, throughout the class. The image here illustrates their mentoring model. The second piece of this model that is eloquently finessed is the coordination between the "college of distance learning" and the "academic division." The team of presenters clearly articulated the importance of understanding that the distance learning college's role is to assess and mentor the online facilitation skills of the instructor. The evaluation of the instructor's subject matter expertise lies in the hands of the academic dean and/or department chair. This is such an important point to highlight and one that is sorely misunderstood and even difficult to pull into focus on many campuses who do not have fully developed "distance learning colleges." 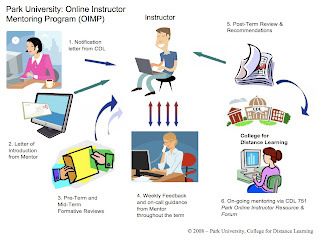 Mentoring and evaluation of online courses are essential to the success of quality distance learning programs; however, the first step is understanding that online courses are different from face-to-face classes and require unique skills, a different pedagogy and, in turn, demand an independent support team. The challenges to this finessed model? Staffing. Not a surprising answer. With the number of online classes Park University has (I believe it was 100), they are challenged to offer the mentoring program and their evaluation program (which is similar to the mentoring program but intended to be performed the first time a class is offered). Their evaluations and mentoring are performed by faculty who are provided with release time each semester as well as the administrator of the College of Distance Learning. Lack of staffing was cited as the number one barrier to the success of their program. The second session I attended was facilitated by Joan van Duzer of Humboldt State and Carole Robinson from Pasadena City College. First let me say ... hooooooray, California!! It was great to have a chance to see innovations in online learning presented on behalf of two California educators that were symbolically representing a partnership between the CSU system and CA Community College system. Additionally, I was recently a student in an online Introduction to Moodle class that I took through @One and it was facilitated by Joan van Duzer, so it was especially fun for me to meet her face-to-face. The session was titled "Now I Can! Successful Online Facilitation" and it provided an overview of an online assessment tool that was recently created through a collaborative project associated with CATS (Community and Academic Technology Staff) and TIGERS. The tool, referred to as an Instrument to Assess Online Facilitation or the AOF, is openly shared online and "is for online course facilitators to objectively evaluate their facilitation for strengths and areas for improvement. Facilitators may choose to offer the AOF to others to guide a peer evaluation of their performance in the online classroom." It's a practical, easy to apply assessment tool that is offered to the public in PDF and Word form so, as van Duzer and Robinson explained, other institutions can customize it to align with their institution's own effective practices. The format of the assessment is based on theoretical literature. The form is divided into four categories of online teaching that flow throughout an online class: pedagogical, social, managerial and technical (Berge and Hootstein). I can imaginge how helpful this clearly articulated tool would be to a new online instructor who has yet to experience these different modes of facilitation. Thanks to the team who created this useful tool and for sharing it with us all. Once again, this year's Sloan-C Conference was GREAT!! I'm looking forward to the '09 Symposium in Emerging Technologies coming to San Francisco in June! Call for papers closes December 8th! !